I received some samples from the good folks over at EP Minerals and EnviroTech Soil Solutions, Inc., who make diatomaceous earth (DE) products. I like and use DE, so it won’t be hard to put them to good use. Algae are simple aquatic plants which include multi-celled forms such as Kelp and more primitive single celled forms such as diatoms. Individually, they don’t live very long, usually under a week, but as a species diatoms are thought to be in the ballpark of 200,000 million years old. Diatoms live in the upper sunlit areas of fresh and salt waters, and are a common phytoplankton. Sunlight is critical to diatoms as they rely on chlorophyll and photosynthesis. Individual diatoms are frequently too small to be seen with the unassisted eye and are usually observed with the aid of a microscope. A special characteristic of diatoms is their ability to make silica oxide shells called “frustules”. These frustules tend to be intricate and geometric, forming a protective silica cover dotted with openings for nutrient uptake and waste disposal. When a diatom dies, the organic portion will decompose and the frustule will sink to the bottom. In areas of dense diatom populations, this can result in a sediment layer formed from a vast numbers of these discarded frustules. While the organic component decomposes quickly, their silica exoskeletons can remain in sediment layers for millions of years. The layers of diatom frustules can be mined, and the material collected is referred to as diatomite or diatomaceous earth (DE). Since the frustules (broken or whole) still have voids and holes they are much lighter and more porous than a solid piece of silica would be. Diatomaceous earth is used in a variety of ways: as a filtering material for swimming pool water, toothpaste abrasive, liquid absorbent, and as an important component of dynamite to name a few. It is also used for gardening. Diatomaceous earth for gardening should be amorphous silica and contain little crystalline silica or active contaminants. 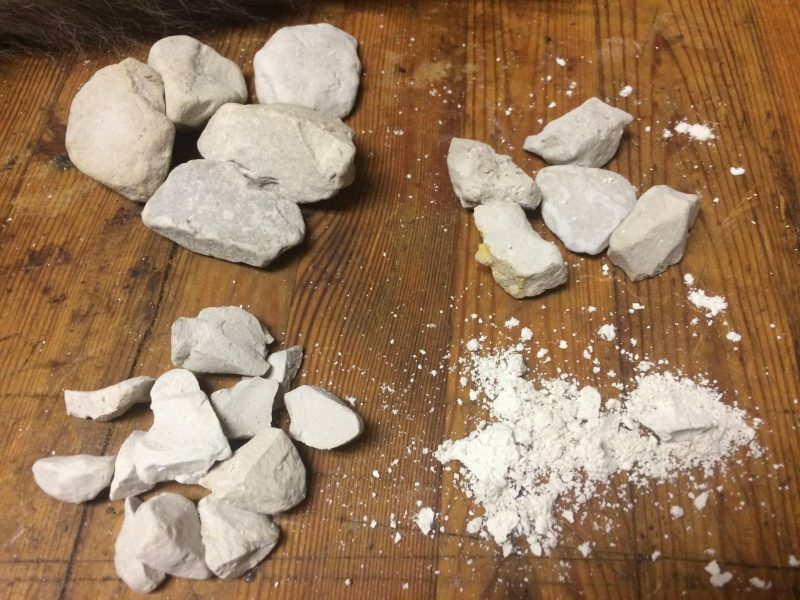 Depending on mining and processing, diatomaceous earth may be sold as chunks of stone of various sizes or ground into a powder. Chunks of diatomaceous earth may be used as a component in a growing medium. By virtue of its voids, it holds both water and air well. It may be used as a substitute for perlite with similar results. 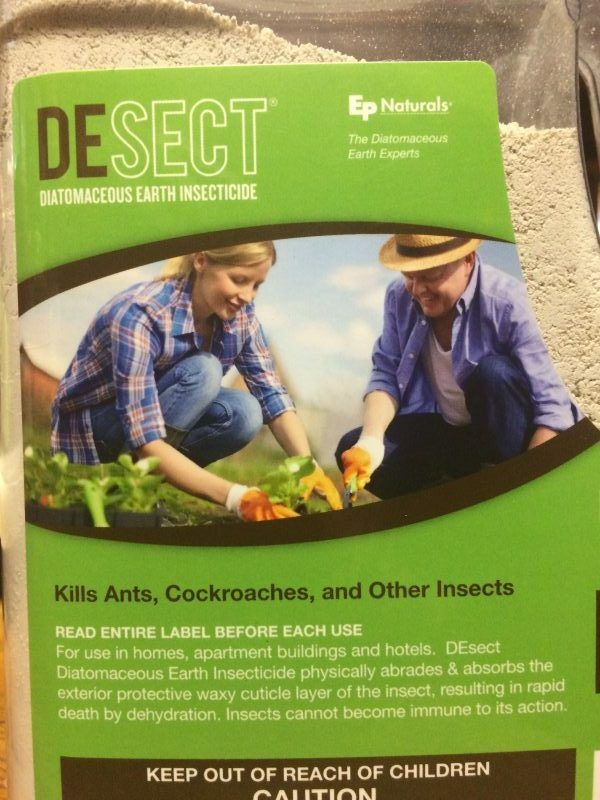 DESECT is a Diatomacious Earth insecticide. Dry powdered diatomaceous earth is used as a mechanical insecticide. It can be used for cockroaches, ants, fleas, ticks, grasshoppers, and a variety of other pests. It absorbs fats and oils from the insects exoskeleton while the sharp edges scrape and damage their protective coating. It is frequently applied to the medium around the plant, but may also be used on plants themselves. A bulb may be used to create a dry cloud for application, but take care to limit inhalation of the powder. It can also be applied by sprinkling dry, or by mixing with water to apply and then allowed to dry. If used directly on the plants avoid harvestable portions as it will leave a residue, and avoid spraying flowers to protect bees. Reapply as needed. While diatomaceous earth is not poisonous and is generally considered to be non toxic to animals, breathing any fine powder can have detrimental health effects. Take care to keep out of eyes and lungs.